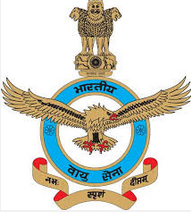 Indian Air Force direct recruitment of Group 'C' Civilian posts in IAF at HQ Eastern Air Command (EAC) Units. Applications are invited from eligible Indian Citizens for recruitment against Group 'C' posts in various Stations / Units in EAC. Eligible candidates apply within 30 days from the date of advertisement in Employment News Paper dated 31st October 2015. Age Limit: Clerk Hindi Typist - 18 to 27 Years; For Others - 18 to 25 Years. Age Relaxation - 05 Years for SC / ST, 03 Years for OBC. Clerk Hindi Typist : 12th pass or equivalent qualification from a recognized Board or University, A typing speed of 30 wpm in Hindi on Computer (Time allowed 10 min) 30 wpm correspond of KDPH on an average of 05 key depression for each word. Store Keeper : Graduate Degree of a recognized University or equivalent pass Desirable Experience in handling stores and keeping Accounts in a store of a concern of repute in Public or private section. D/ Man III : Matriculation or equivalent from a recognized Board / University, 02 years Diploma in Mechanical / Drawing or Civil Engineering of Mechanical Engineering or Electrical Engineering or Draughtsmanship (Mechanical or Civil) from an Industrial Training Institute or equivalent recognized Institute, Five years experience in Draughtsmanship in a reputed Firms / Govt Institute. Cook & Mess Staff : Matriculate or Equivalent from a recognized Board / University with six months experience in the trade. Painter & Carpenter : Matriculate or Equivalent from a recognized Board / University and possessing ITI Certificate in the appropriate / akin field or trade. Safaiwala : Matriculate or Equivalent from a recognized Board. Dhobi : Essential - Matriculation pass or equivalent qualification from a recognized Board. Desirable - 03 Years of experience as Dhobi from an Organization Institute. Vulcanizer : Matriculate or equivalent from a Recognized Board. Labourer on ammunition duty : Matriculate pass or equivalent from a Recognized Board University. How To Apply: Application as per prescribed format (typed in English), pasted with recent passport size photograph duly attested by self along with the photocopy of the following supporting documents also duly attested may be sent to Officer-in-Charge Civil Admin Section of the concerned Air Force Station :- (i) Proof of date of birth (ii) Educational qualification certificate, (iii) Any other documents as required, (iv) Self address with stamp(s) of ₹ 5/- pasted also to be submitted. Address should be typed or neatly handwritten in English, (v) Applicants should prominently annotate his / her contact number (mobile or landline) on the application. Application must be submitted within 30 days from the date of publication of the advertisement (i.e. Last Date may be 30/11/2015).